Most Westerners live in one of two types of house. Either it is masonry, solid, strong, but not much good in an earthquake, or they are in a wood-frame cage with the gaps filled in with drywall and stucco. High rise dwellers may instead be in a steel cage with concrete floors and glass walls, and only a sprinkling of drywall to divide spaces. But why do we build this way, year after year, decade after decade? Surely in this age of technology there should be materials that don’t crumble, rot, fall apart, get ruined by a water leak or get eaten by bugs. Is the nail gun, some bolts, some pine planks and some plaster sandwiched between two sheets of gray paper all we can find to make a home out of? 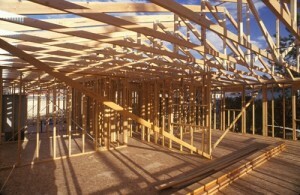 It often seems that all new home-building products are just variations of wood, paper, and powdered earth. Why is that? Is it the drive to have recyclable debris when the building is eventually demolished in the future, or is it more a case of buying wood because wood is for sale, and building with carpentry because most home builders are carpenters? New materials and products are finding their way into home construction. 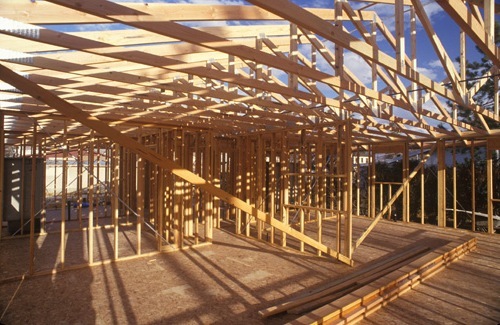 Structural Insulated Panels, or SIPs can replace timber frame, insulation and drywall. They are light, energy efficient and are a self-contained alternative to that wall behind you. They are made of fiberglass surrounding foam. Modular construction, which is a nice way to say pre-fab, is a different way to build, but usually these systems are made of the same old wooden planks, drywall etc. Just waiting to be ruined by floods and bugs etc. Steel-framed houses use steel to replace the planks, but they fall back on drywall and other traditional wall materials to finish. Concrete blocks can be used like bricks, but they may not be able to withstand an earthquake because there is no flexibility. Engineered wood is strong and flexible but it can be ruined if it gets soaking wet. All of the above alternative materials don’t really take us to a new way of building. A glimpse of potential can be seen in houses that repurpose shipping containers into structural components. These houses are interesting and they work, so we can consider new ideas for construction that use fresh components rather than shipping containers. Some green-minded builders are looking at ancient materials such as straw bales, cob (mud and straw), and rammed earth. These things are obviously sustainable and recyclable and have little or no environmental impact, but you would not want such a house to go through a flood. And there may be many little things that would like to feed upon them. The steel frame and the SIP are steps in the right direction, as long as we continue to feel at home in true rectangular spaces but with all the advancements in engineering and science, there must be something that we are neglecting to think about. Different materials, different methods, completely different things for us to enjoy living in. Please use the feedback feature to chime in with truly alternative ideas. NextNext post: Yes, cats do smell terrible. When the Pilgrims arrived they didn’t have time to build the traditional rock-walled homes and instead built wood-frame, which were faster to erect. Then the temporary became accepted and permanent.